Lovely Zebra Jasper palmstone with a subtle pink hue and lovely veining. Jasper is essentially an impure form of Agate. It is these very impurities, however, which give us the beautiful and wide range of colours. It can be found in many locations worldwide. The properties of Jasper vary from stone to stone depending (mainly) on their colour, but all Jaspers share some common properties. Jasper is generally known as the supreme nurturer, and it is another stone often overlooked in favour of rarer or more exotic specimens because of its ready availability. It is a gentle stone, and can help increase our ability to relax. Sitting quietly with a piece can give us a feeling of tranquillity, peace and well-being. 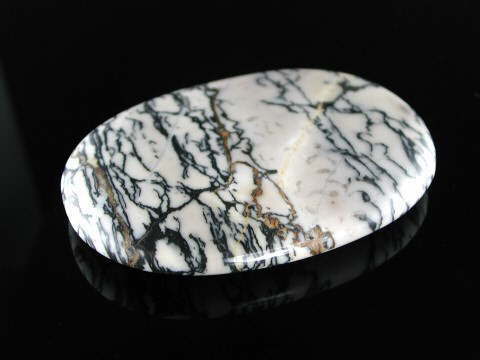 More specifically, Zebra Jasper, with its black and white colour, is also an excellent stone for balancing Yin and Yang energies.